This astonishing photo of a cosmic body orbiting Saturn is prompting some to call it a "space ravioli." A new photograph has just been released by researchers using NASA’s Cassini spacecraft near Saturn, and it’s getting the attention of many in the space community. 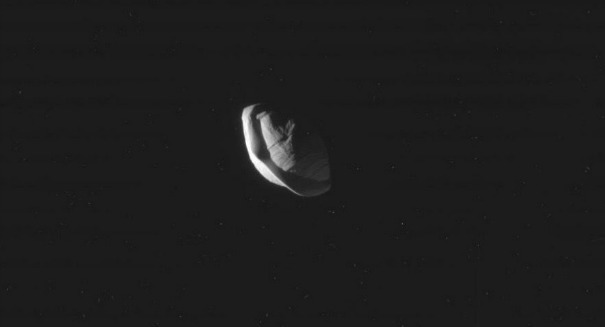 This picture of the tiny, elusive moon “Pan” orbiting Saturn is prompting some to call it a “space ravioli,” and it’s the best picture we’ve yet gotten of this odd looking moon just 22 miles in diameter. The images were taken back on March 7 after Cassini zoomed past the moon from a distance of just 15,268 miles. It is one of more than 60 moons that orbit Saturn, with many of them being quite small and irregularly shaped like Pan. Iapetus, for example, has drawn comparisons to a giant walnut because of its equatorial ridge, and Mimas has been likened to the Death Star because of a massive crater. These many diverse moons are of huge interest to the scientific community. The giant moon Titan, for example, is the only other known cosmic body in our solar system other than Earth with stable bodies of liquid, although hydrocarbons rather than water make up these oceans. And Enceladus has been proposed a possible place where life could exist under because of its oceans underneath an icy crust. NASA says on its website: “Pan, the innermost of Saturn’s known moons, has a mean radius of 8.8 miles (14.1 km) and orbits 83,000 miles (134,000 km) away from Saturn, within the Encke Gap of Saturn’s A-ring. As it orbits Saturn every 13.8 hours, it acts as a shepherd moon and is responsible for keeping the Encke Gap open. The gap is a 200 mile (325 km) opening in Saturn’s A ring.